Come 2022, the US will produce more than a fifth of the world’s gas, putting it on the same level as top gas exporters such as Russia and Norway, the agency predicted. As an exporter of liquefied natural gas (LNG), it would become second biggest in five years, behind Australia but above Gulf state Qatar. The three major fossil fuels—petroleum, natural gas, and coal—accounted for most [78%] of the nation's energy production in 2016. The chart below illustrates how dramatically fossil fuel production has increased in recent years. 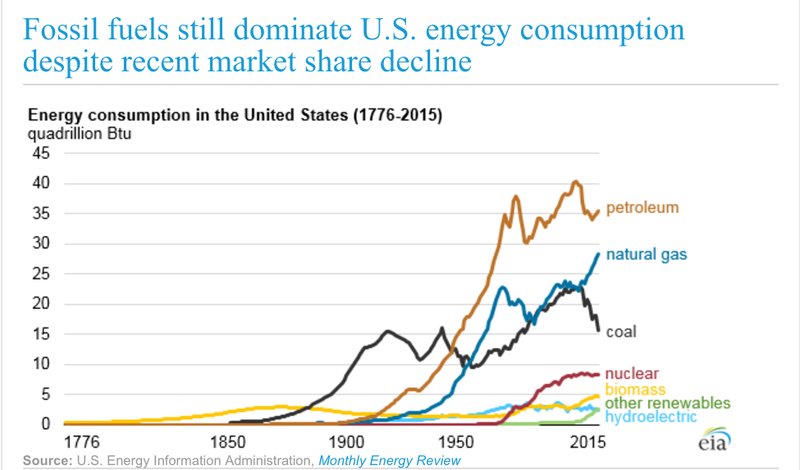 In 2015, the renewable share of energy consumption in the United States was its largest since the 1930s at nearly 10%. Chart courtesy of U.S. Energy Information Administration. While “energy independence” advances important U.S. foreign policy goals, domestic fossil fuel production also creates increased public health and environmental risks at home. As production of natural gas and crude oil has increased exponentially over the last 15 years, EPA and the States have been challenged to keep pace with corresponding increases in air emissions, water discharges, transportation and facility spills and cleanup requirements in the oil and gas sector. EPA’s FY17 Performance Plan included 37 programs and targeted activities aimed at addressing increased public health and environmental risks from oil and gas production. In several instances, the Agency requested additional funding to effectively implement these activities. The Trump Administration’s FY18 proposed budget slashes funding for all of these oil-and-gas related pollution control activities, outright eliminating many. These actions represent a major shift in EPA's priorities: away from protecting public health in favor of expanding oil and gas production. In 2016, EPA finalized new air pollution control standards for the oil and gas sector, aimed at addressing leakage of methane and volatile organic compounds (VOCs) from all stages of oil and gas production. After telling States to not implement these new standards, the Trump Administration has initiated various strategies to delay and eventually roll back these controls. EPA also recently finalized new emission limits for hazardous/toxic air pollutants from petroleum refineries, which are not addressed in the FY18 budget. In FY17, EPA established two high priority enforcement initiatives related to these new air pollution standards: cutting hazardous air pollutants from petroleum refineries; and ensuring protective energy extraction (natural gas). As a first step in this enforcement initiative, EPA issued a nationwide Information Request to the oil and gas sector in 2016. Administrator Pruitt withdrew this Information Request almost immediately upon taking office. Voluntary programs aimed at reducing leakage and capturing methane for productive use have also been eliminated in FY18. A cross-agency (EPA, DOI & DOE) research program addressing air quality impacts from unconventional oil and gas activities (a FY17 priority) is not addressed in the FY18 budget. In addition to being a greenhouse gas “super-pollutant,” methane and associated VOCs contribute to asthma-inducing, ground-level (ozone) smog. In FY17, EPA identified five public health-focused asthma programs as funding priorities; all of these programs are eliminated in FY18. The Trump Administration’s attempt to delay (without process) implementation of EPA’s ground-level ozone standards was recently blocked in federal court. EPA regulates and enforces petroleum discharges into water resulting from drilling operations, storage tanks, industrial processing and pipelines. In 2016, EPA finalized settlements from the 2010 Deepwater Horizon/Gulf of Mexico oil spill, collecting upwards of $20 billion. A substantial portion of this funding is dedicated to ongoing restoration of coastal and marine natural resources damaged by the spill. In its FY 18 budget proposal, the Trump Administration states that EPA will continue to participate in Gulf restoration activities (a statutory requirement). However, all of the coastal and marine pollution programs that support such work (including the Gulf of Mexico geographic water program) are eliminated. Funding for EPA’s Wetlands Program (which oversees Army COE permitting for Gulf restoration activities) is reduced by 15%. EPA’s FY17 budget includes a research program aimed at improving oil spill control agents used use in deep water marine environments and arctic conditions. It is not clear how such research can continue without support from those eliminated marine pollution programs. Over half of people living in the US, and 99% of people living in rural areas, get their drinking water from groundwater supplies. Oil and gas extraction, injection and disposal wells are frequently drilled into formations that are connected to drinking water aquifers. EPA and States regulate oil and gas wells through the Safe Drinking Water Act’s Underground Injection Control program. In FY18, funding for State/Tribal permitting activities is reduced by 30%. EPA oversight of permitting activities is not addressed. Permitting for geologic sequestration of CO2 is not addressed, nor is a study into fracking’s impacts on drinking water. EPA’s “best practices” to protect drinking water from fracking are being replaced by “best practices in oil and gas development, such as reuse and recycling of produced water” (to be developed with industry groups). More than half a million releases from underground storage tanks (containing petroleum and hazardous substances) have been reported since the program began in 1988. In FY17, EPA reported that about 86% of these LUSTs had been addressed; those remaining are complex and expensive to address. EPA has also increased compliance monitoring at facilities with active USTs to prevent new links, a strategy the Agency identifies as essential to addressing the backlog of cleanups. In FY18, the Trump Administration proposes to reduce funding for the UST/LUST program by 48%. The Leaking Underground Storage Tank Prevention program (compliance inspections) is eliminated. Funding for State & Tribal UST/LUS programs is eliminated. Funding for the LUST cleanup program is reduced by 30% for both States/Tribes and EPA. Since 2010, EPA has been steadily bringing facilities into compliance with spill containment and emergency planning requirements through targeted inspections, compliance assistance and enforcement. In FY17, EPA aimed to bring 60% on non-compliant facilities into compliance. The FY 18 does not establish compliance targets. EPA is the lead responder for cleanup of inland zone spills (pipelines, trucks, railcars, and other transportation systems), and provides technical assistance/support to the U.S. Coast Guard for coastal and maritime oil spills. The FY 18 budget indicates that EPA’s role in responding to marine and coastal spills will be reduced (or eliminated). EPA provides training and technical assistance around response to chemical and oil incidents for emergency responders in states, local communities, tribes and other federal agencies, and industry. in FY18, EPA’s role in training and technical assistance is scaled back. The 2013 fertilizer plant explosion in West, Texas, prompted a comprehensive review of safety planning at industrial facilities. In 2016, EPA finalized the Risk Management Program rule, based on recommendations from the Chemical Facility Safety and Security Working Group (and after extensive public engagement). The FY17 budget identified implementation of this new rule as a priority. Following Scott Pruitt’s appointment as EPA Administrator, seven industry trade associations petitioned for reconsideration of the Risk Management Program rule (American Chemistry Council, American Forest & Paper Association, American Fuel & Petrochemical Manufacturers, the American Petroleum Institute, USA Chamber of Commerce, the National Association of Manufacturers, Utility Air Regulatory Group). In response, the Trump Administration delayed rule implementation and stated its intention to “reconsider” the rule. (Twelve states have sued to force Rule implementation.) The Trump Administration has also targeted the Chemical Safety Board for elimination. An FY17 enforcement priority 2017 was “ Reducing Risks of Accidental Releases at Industrial and Chemical Facilities (Fiscal Years 2017-19).” The enforcement initiative is not addressed in FY 2018. In FY17, EPA planned increased inspections, training & compliance activities at high risk chemical facilities; the status of these increased compliance activities is unclear for FY18. EPA’s national response coordination and training activities for local responders are also scaled back. The TRI report and associated stakeholder engagement activities are being scaled back in FY18. Facility compliance and enforcement assistance activities provided through this program are not addressed in FY18.